A new species of Early Cretaceous bird was reported on January 6th in Zoological Journal of the Linnean Society by Min Wang, Zhonghe Zhou and Shuang Zhou from the Institute of Vertebrate Paleontology and Paleoanthropology (IVPP), Chinese Academy of Sciences. The new discovery provides new information regarding the evolution of morphology of primitive ornithuromorphs, particularly of pectoral girdle, sternum and limb proportion pertaining to powered flight. Ornithuromorpha is the most derived avian group in the Early Cretaceous, advanced members of which encompass all living birds (Neornithes). 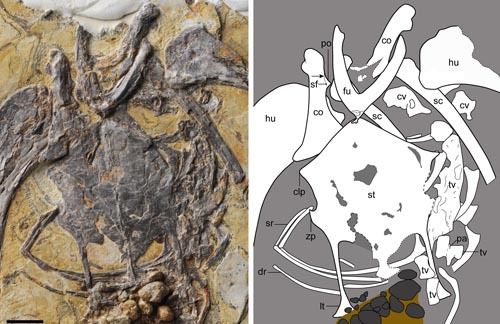 The first known appearance datum of this clade is from the Yixian Formation—the middle phase of the Jehol Biota (e.g., Archaeorhynchus and Yixianornis), whereas the younger Jiufotang Formation has produced more than half the named Jehol ornithuromorphs (e.g., Jianchangornis, Schizooura and Piscivoravis), which together recorded over five million years of early evolution of this avian group. The new fossil bird is represented by a nearly complete skeleton, collected from the Early Cretaceous Jehol Biota in northeastern China. The specimen is housed at the Institute of Vertebrate Paleontology and Paleoanthropology (IVPP; Beijing) under collection number IVPP V17970. The new bird is preserved with its wings and legs fully outstretched, mimicking a dancer; and its manual claws are barely recurved; therefore, the new species is named Bellulornis rectusunguis to convey these features. A comprehensive phylogenetic analysis resolved the new taxon in a basal position that is only more derived than Archaeorhynchus and Jianchangornis among ornithuromorphs, increasing the morphological diversity of basal ornithuromorphs. The new specimen has a V-shaped furcula with a short hypocleidium, a feature otherwise known only in Schizooura among Cretaceous ornithuromorphs. We discuss the implications of the new taxon on the evolution of morphology of primitive ornithuromorphs, particularly of pectoral girdle, sternum and limb proportion pertaining to powered flight. The preserved gastroliths and pedal morphology indicate herbivory and lakeshore adaption for this new species. Figure 1. The holotype of Bellulornis rectusunguis. Figure 2. Sternal morphology of Bellulornis rectusunguis.